to see if you have an email from me, if you are expecting one. If you don't see it, please send me an email I will reply. Then if you do not get a reply within a a day please call me. We always mail the package to your credit card billing address. Expecting an email from me? Haven't received it? I only do email support, and I only do support for customers who bought the system (CD, CD and book, Download) from this website. SORRY, but I do not give free support if you purchased ONLY the paperback book or Kindle version. Outside the US? Send payment by Western Union or MoneyGram. Checks/money orders need to be made out to JudgmentCenter.com, if you send me a certified letter can you let me know its coming so I can make sure I am there when the mailman delivers it? Check your BULK and SPAM folders first to see if you already have it. You can send us your resume in .pdf format, do not include personal information such as DOB or SSN. You don't have to include home address either. Send email to: steve @ judgmentcenter .com (remove spaces). Your payment will go to us at JudgmentCenter Allhomebased 321cam. Your payment will appear on your card statement as "PAYPAL *JUDGEALLHOM". You will receive an email receipt after payment. I am a real person. I Have been in the news many times. Do you want to see what I do besides Judgments? Go to the following link, all of these are of the TV news interviews over the last few years. IMPORTANT: I use PayPal.com to process your payments. I service these four websites using PayPal. Your satisfaction is my top priority. If you have a problem with a transaction, just let me know and I will work with you to resolve the issue. You can call me at 1-651-321-3131. I will make every effort to respond to all customer service inquiries within 1 business day or less. I had to implement this because of people digging through the code and getting the Thank You for Payment webpage that contained the link to the instant download and they got the information without paying. As soon as I see the order I will send an email to you with a link, userid and password to the download. For faster response please send me an email and I will reply to it with the link, userid and password to the download. You must provide a valid phone number in your order. I call it to let you know that I received the order and its expected shipment date AND also to verify you to help prevent fraud. I will ship it www.USPS.com Priority Mail with a tracking number sent by email and it also sent with signature required. There are never any recurring charges. All products/services are a one time charge through PayPal and paid to "JudgmentCenter Allhomebased 321cam" which are all run by Steve Cook. How much is my judgment worth today? www.JudgmentCenter.com was started in 1999 by Steve Cook who operates as a judicial judgment processor in the business of collecting money owed to plaintiffs awarded money judgments. During the past several years Steve has collected judgments ranging from $1,000 to $19,000 using using a variety of techniques to uncover assets, which may then be levied to satisfy judgments. 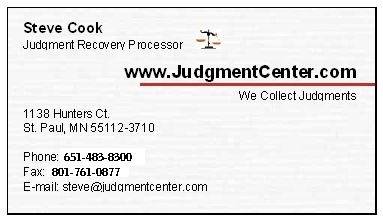 Over the past few years www.JudgmentCenter.com has collected judgments for a variety of clients. We have built a reputation based on honesty and results. 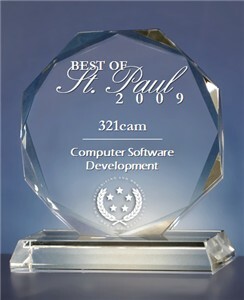 The services have been used by attorneys, business owners, and individuals alike. They have come to know www.JudgmentCenter.com and depend on Steve for our quick service and ability to produce. As mentioned earlier, www.JudgmentCenter.com was founded by Steve Cook who is also the author and publisher of this program. Employee of credit bureau score company for 6.4 years. With all the real estate experience and the credit score company experience Steve Cook started collecting judgments. Therefore, all of the information is my own actual first hand experience in conducting the Judicial Judgment Processing Program. I continue to conduct the business myself and usually collect several judgments each month. Information contained in this program is compiled from the author’s own experience and is believed to be complete. The entire program is designed to provide information regarding the subject matter and any opinions given are based on the author’s experience, and considered true and accurate, but not infallible. This information is sold with the understanding that the publisher is not engaged in rendering any legal advice. If legal advice is required, the services of an attorney and/or accountant should be sought.